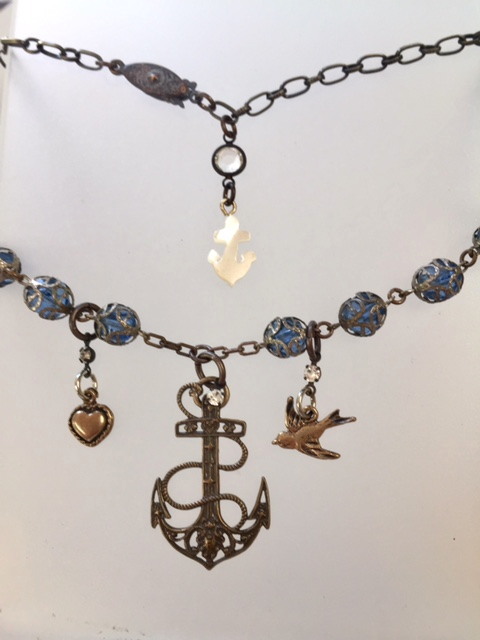 A simple, yet elegant Bronze Anchor, Heart and Dove charms suspended on antique French Blue bead double capped crystal beads and link chain. All charms are Cast from the original antique European medals; over a century old, this lovely reproduction is hand crafted. They are solid Bronze and aged to a wonderful old world patina. The Anchor comes from a small village north of Paris called Chatou. Czech Rhinestone drops were added to add a bit of sparkle and catch the light as well as a Mother of Pearl Anchor at the closure. Necklace is 18" Long, (adjustments can be made) Anchor is 1 3/8" by 7/8"